The shooting, which took place on January 7th, 2015, took away the lives of 12 people. Around this time last year, two radicalized French jihadists attacked the Paris offices of a satirical weekly Charlie Hebdo, killing eight of its staff and a dozen people in total. The shooting, claimed by an Al-Qaeda branch in the Arabian Peninsula, was reportedly provoked by some of the magazine’s past controversial content, namely its offensive depiction of Islam’s Prophet Muhammad. In 2011, Charlie Hebdo’s offices had been burned down by a petrol bomb as a response to its previous week’s “sharia” edition, which had mockingly portrayed the Islamist victory in Tunisia and the Prophet Muhammad. Many of the staff, including editor Stéphane Charbonnier who was killed during the incident, had lived under high-profile police protection since then and received countless death threats. After the 2015 shooting, the remaining team of staff had to relocate to a heavily guarded new premise, the address of which has not been made public. “We’ve had death threats for years and we thought they would stop (after the attack), but they haven’t. If anything, they’ve increased,” said Patrick Pelloux, a Charlie Hebdo columnist and a casualty doctor who treated victims of the Nov 13 massacre in Paris in which 130 people died. The public decried this shooting an open assault on the freedom of expression. 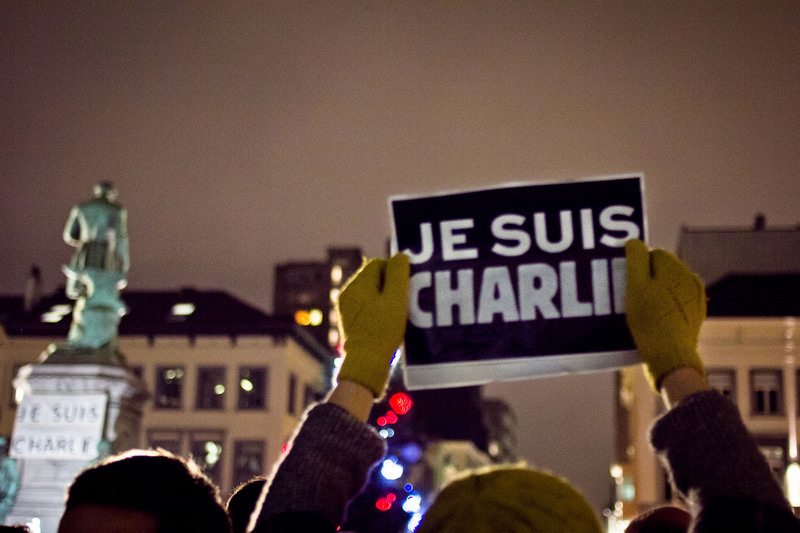 Hundreds of thousands of people around the world marched in solidarity and subscribed to the magazine; hashtag #JeSuisCharlie flooded social media. And when another shooting in February took place in Copenhagen, at an event on “art, freedom of expression and blasphemy,” Europe entered into a war against anything that would threaten its sacred freedom of expression. Due to fear and distress, France’s political landscape has changed since then. The so-called ‘culture war’ has given momentum to fascist far right parties in recent elections, and the leader of the country’s main opposition party Nicolas Sarkozy has called for a new immigration and security policy. Public outrage or unrest is understandable. 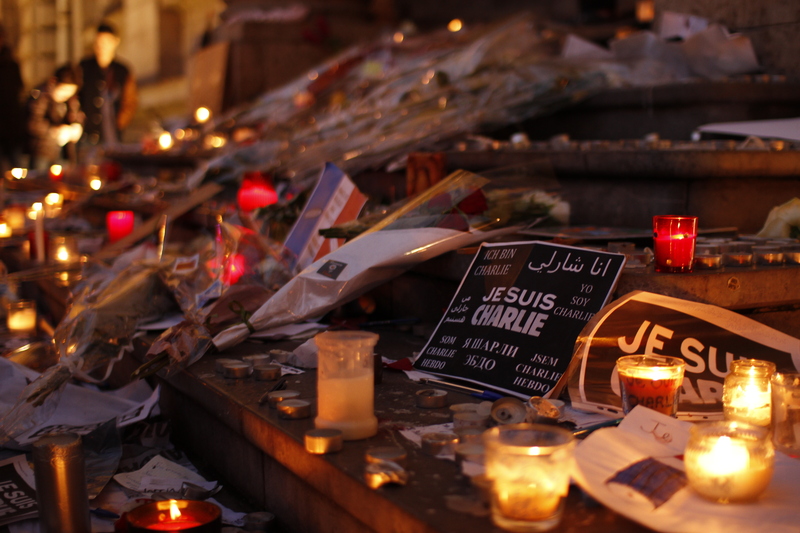 Until recently, the refugee crisis and the Charlie Hebdo shooting had existed in two seemingly different realms – the only common ground being the fact that radicalized Islamic jihadists are to blame. The former has been a problem with most of its tangible impact in the first world being the substantial inflow of refugees, while the latter was a direct affront to the fundamental values of our democracy. Many had drawn the distinction between their moments of compassion for heartbreaking headlines about refugees in media and the gradually but concurrently growing anti-foreigner sentiments that conjoin the refugees, the ISIS, and every other migrant into one united target of suspicion. Throughout 2015, series of events have greatly swayed back and forth the pendulum of public sentiment regarding the refugee crisis; the recent New Year’s Eve sexual assaults in Cologne, Germany, initiated a manhunt for asylum seekers who are the alleged offenders. The overwhelming sympathy towards Alan, expressed just a couple of months ago, has become less prevalent and has been replaced by anger, racism, and even fascism. So it may be that many people are missing the ‘point’: that Charlie Hebdo’s recent comic strip is not endorsing but rather lampooning the ingenuity and fickleness behind the world’s sympathy towards Alan. Admittedly, satire’s merit lies in its boldness of condemning what is often unspeakable, and allowing popular opinion to determine the boundary of acceptable speech will defeat its benefit of giving a voice to the minority or the oppressed. On the other hand, satire is a powerful weapon which almost always entails a prey. Gary Trudeau, the cartoonist behind the renowned Doonesbury, encapsulates its definition as such: “Traditionally, satire has comforted the afflicted while afflicting the comfortable. Satire punches up, against authority of all kinds, the little guy against the powerful. Great French satirists like Molière and Daumier always punched up, holding up the self-satisfied and hypocritical to ridicule.” But when that prey is the non-privileged, then satire stops being funny. “It’s just mean,” Trudeau says. There is only a very thin and ambiguous line between satire and hate speech, and its meaning and value can quickly degrade if it doesn’t concur even with the sentiments of the particular audience from whose perspective it hopes to criticize. In all likelihood, people appalled by this cartoon are not only those who were called out on their hypocritical racism, but also those who have understood its assumed intention and might have otherwise sympathized with Charlie’s accusation. So maybe Charlie Hebdo missed the point. Albeit less effective, the delivery of their message did not necessitate such a flagrant depiction of Alan, whose death needs not be a subject of mockery even in the name of satire. The public reserves the right to scorn the recent comic, because condemning an expression for its insensitivity, or asking for some civility, is not bigotry nor shutdown of dissent. In general, much discourse on freedom in a democracy is inherently self-contradictory. It is regrettably true that no liberty is absolute and one often comes at the cost of another. Freedom of expression is rarely discussed today without polarizing the two rights: the right to offend and the right to not be offended. Yet in reality, the debate over which right takes precedence should become the question of “You can, but should you?” Whether it’s a gross oversimplification, consider spoiling the ending of a much anticipated film as an example. If not restricted by law, you will have the freedom of doing so, but it’s unquestionably insensitive. Especially if it involves a pig-like sexual offender depiction of a toddler who had drowned to death while fleeing. All images courtesy of Flickr Creative Commons. May is a third year International Development Studies student minoring in political science and East Asian studies. Her writing interests include the ever-changing political dynamics of the world, international relations, and foreign policies with regards to human rights.